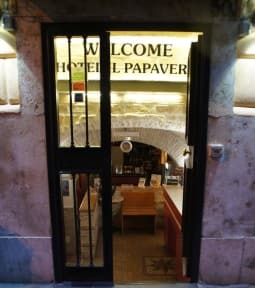 Hotel Il Papavero i Rom, Italien : Boka nu! When we were gonna leave the keys at the reception it was closed even though they said it would be open 24/7. We used the bell but no one came in several minutes. We were in a hurry to catch our flight so we went back to our room and asked one of our roomies to leave the keys for us. On our way back we saw that there now was someone in the reception, so we told him we left the keys to our roomie. He then started to threaten us to charge "our card" and yell at us. So rude. Totally unacceptable.